Adding a tent to your quote only adds the tent frame, top, and installation. If you would like to include lighting, sidewall, fans, heaters, or any other add-ons, please select them from our "Tenting Accessories" section, or include the request in the comments section on your quote before submitting. 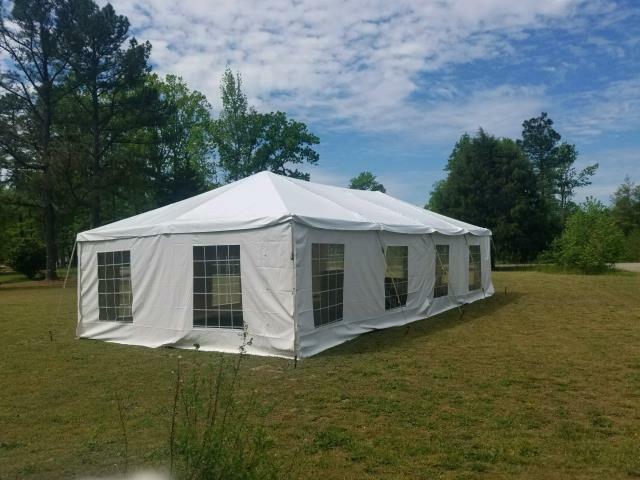 Any tent larger than 900 square feet will require a permit - Party Perfect can obtain this permit for a small fee, and a salesperson would be happy to discuss the permitting process with you! If your tent will be going on a hard surface and cannot be staked into the ground, we will need to add on concrete weights to your order. A salesperson can calculate this for you. If you are unsure of what tent size you need, feel free to call our office to discuss your needs with a salesperson, or reference our tenting size chart in the resources category of this website.